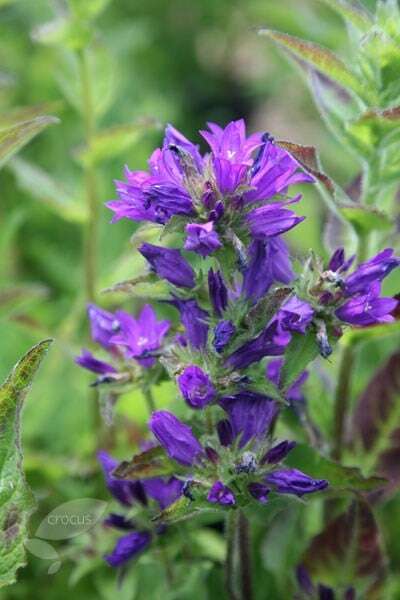 Dense heads of large, rich purple, bell-shaped flowers appear from June to August on tall stems that rise above rosettes of oval, mid-green leaves. This beautiful bellflower is perfect for a sunny, cottage-style or herbaceous border and is equally happy in partial shade. Garden care: Avoid planting out seedlings until all threat of frost has passed. During the growing season water freely and apply a balanced liquid fertiliser each month. Cut back after flowering, both to prevent self-seeding and to encourage a second flush of flowers. I have left this review for a year to see how the plants reacted to the weather. Perfect. I have one in a flower bed and one in a pot on the patio. Although they flower only for a few months in mid summer, it is worth it. A very striking plant. We have had a mild winter in this part of the country but I would imagine if we had a hard cold spell this plant would need mulching (f.bed) or covering (pot). I think that because of its upright stance it looks better in the pot. I absolutely love this plant, the eye cannot help continually wandering to it as the foliage is a lovely colour but the flowers are absolutely stunning. The first comment from my Mother was "why did you only buy one"! I will definitely be buying more. The flower stems do need caning, however the foliage and flowers are so dense you don't notice the canes at all.